First impressions are everything and Vanda Coatings can help transform various types of metalwork with beautiful and durable finishes. 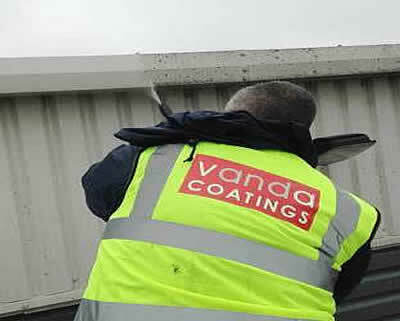 Find out more about Vanda Coatings. Architectural features look better and last longer after clients have used our service. Vanda Coatings are proud to have successfully completed numerous projects on behalf of major national high street retailers, supermarkets, car showrooms and office buildings. We have also refurbished the premises in the leisure industry, the educational sector, medical buildings, restaurants and all other types of commercial properties. We are a family run company with a vast nationwide network of teams of paint sprayers who will deliver our professional onsite service to wherever you are in the UK. Our fully employed experts are experienced in the most advanced techniques including electrostatic, airless and HVLP spraying and we can help you choose the most appropriate method for every different type of metal item that needs recoating. The Vanda operatives are highly qualified and we ensure they receive ongoing training. Safety is our priority and Vanda Coatings are certified with Safecontractor, SMAS, CHAS and Constructionline. We are also insured up to £10 million. All of our clients have a common desire, namely to make their business premises look the best they possibly can and for their property to be protected from the elements as well as wear and tear. 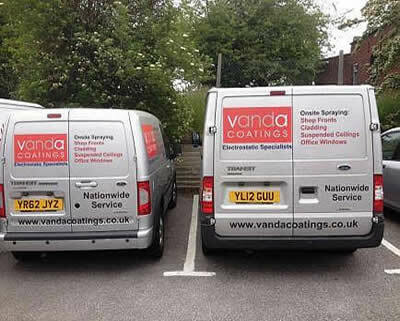 At Vanda Coatings we fully understand the importance of corporate image and the need to create the right impression. We have built up an enviable reputation based on quality and service delivered at a cost effective price with customer care at the forefront.